I'm still being a tad quiet regards emails and blogland visits... selfish as it may be, it's been needed; sorry about this folks, please forgive me. The ol' brain is settling down a bit and my time is starting to feel more like my own again. Onto spinning. Now, I basically taught myself on my wheel, and being as I no longer have that the drop spindle has stepped in and muddled up my process. Seriously, it's been driving me potty. The brains of the lovely folks at UKSpinners have been picked in an effort to find a gadget that's small enough for travelling, cheap enough for my budget and that will give me the results I want. But you guessed it, everything comes back to that pesky spindle. Obviously I need to find one I can work with rather than the cheapy job I bought a while back, but my frustration has put me off a bit. Meantime, that lovely boyfriend of mine started thinking of ways to help me out. And you know what? He bloody well did it :) Bringing together the principles of the wheel and the spindle, with a bit of electricity for good measure, we've devised a method that works. It doesn't just work, it rocks. Not only that, it's components are things we have, use and need and can be taken apart at the drop of a hat for storage. I will blog about this, I promise, but at the moment we're doing a bit of fine tuning and would rather share the method when all the glitches have been smoothed out. Watch this space. I will though show off some yarns made this week using this super dooper method. My first spun yarn in a few years! Started life as some undyed Blue Leicester (I think), spun rather unevenly, dyed purple whilst setting and then plied with some fine slubby grey silk. Not sure if I'd use it, mind, but not a bad effort. Think there's just under 100g. All materials from Handweavers Studio. 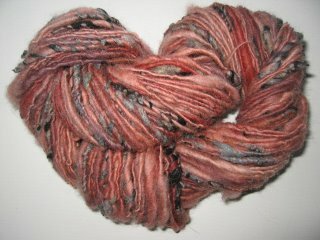 100g of single ply, spun from hand-dyed Gotland curls. Rather Noro in colouring, don't you think? Bought this fibre from the lovely lady at Pure Inspiration; can't recommend her enough. The photos in her shop don't do the fibres justice - they are for more beautiful in real life. As much as I like this yarn and the fibre was sooo long and easy to spin, it was an absolute poo to card. I hand dyed this one meself, various shades of blue - from that welsh lambswool fleece I bought a while back. Fleece really takes the dye differently! Being as it was my first raw fleece, I probably didn't sort it well enough as there was a fair bit of kemp and rough bits. Nonetheless it's been softened and is lovely. I spun in random sections of pewter grey merino which gives a nice contrast. Single ply, just under 100g. And I've saved my favourite 'till last :) Again single ply, probably enough for a hat. Hand-dyed dark pink tones of Border Leicester, again from Pure Inspiration. The slubs are mixed greys and black silk noil... these bits have hardly any staple length as they're the leftovers from mulberry silk, but damn good for slubs. Have about 230g of this pink stuff left as well as other colours, so can't wait to get spinning it again - after just a quick card it's easy to spin and very soft.